We’re delighted to announce one of the finalists in the FIBEGA Miami 2019 Gastronomy Tourism Awards in the category - Best Promotional Local Dish. The first finalist is the Dominican Republic’s “La Bandera”, a traditional dish, which is a staple of the Dominican lunch. A country with vast native dishes originating from the Spanish heritage of the island, along with roots from West African and the Indigenous Taino’s. “La Bandera” is often said to be a representation of The Dominican flag, a meal of stewed meat (usually chicken) in a base of tomatoes and onions, served over white rice with red beans, tostones (twice-fried green plantains) and a salad. Cooked daily with fresh ingredients, it could be found from restaurants to homes across the island. Dominican Republic is an Island located in the heart of the Caribbean on the Island of Hispaniola sharing a border with Haiti. Its geographical location bears exotic fruits and vegetables, integrating them into the gastronomy of the country. Sample dishes of the culinary influences on the island are varied like the Casabe (bread made out of root vegetable yuca) a Taino dish. The Spanish influence can be found in desserts like arroz con leche and a well-known dish Mangú– mashed and boiled plantains, the original name is fufu and its origins can be traced back to west Africa. Massiel Olmos, Artistic and Culture Representative, from the Ministry of Tourism of The Dominican Republic shares with us some favorites in addition to the popular "La Bandera": "We have a significant offer of gastronomic products in the typical Dominican food restaurants". 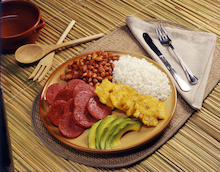 “Some other dishes that are worth trying as Locrio, a blend of rice with chicken, longaniza (sausage), and pork chops”. We also have a variety of fresh fish with coconut, sweet beans and tostones. The recognized mofongo (tripe) and the pastel en hojas. Another emblematic dish of our kitchen is sancocho, made with chicken, pork and tripe, although the most known is the sancocho de siete carnes and black beans(soup of the seven meats). An authentic and refreshing drink in the Dominican Republic is “morir soñando” literal translation is “death by dreaming”, a perfect mélange of orange juice and evaporated milk. You can’t visit the Dominican Republic without sampling one of the most popular and known drinks by excellence which is the islands well-known variety of rums.